Ashdod (Ebreu: אַשְׁדּוֹד‬ (audio) (help·info); Arabic: اشدود‎, إسدود Isdud), is the fift-lairgest ceety in Israel, locatit in the Soothren Destrict o the kintra, on the Mediterranean coast, locatit 32 kilometres (20 mi) sooth o Tel Aviv an 20 kilometres (12 mi) north o Ashkelon an 53 kilometres (33 mi) wast o Jerusalem. Ashdod is an important regional industrial center. The Port o Ashdod is Israel's lairgest port accoontin for 60% o the kintra's importit guids. The first documentit dounset in Ashdod dates tae the Canaanite cultur o 17t century BC, makin the ceety ane o the auldest in the warld. 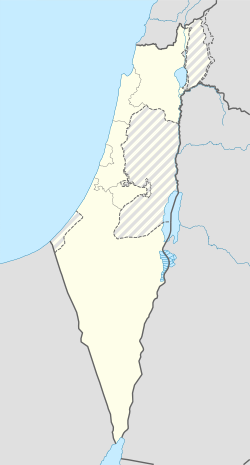 Ashdod is mentioned 13 times in the Bible. Durin its history the ceety wis settled bi Philistines, Israelites, Byzantines, Crusaders an Arabs. Modren Ashdod wis establisht in 1956 on the saund hills near the site o the auncient toun, an incorporatit as a ceety in 1968, wi a land-aurie o approximately 60 square kilometers (23.2 sq mi). Bein a planned ceety, expansion follaed a main development plan, which facilitatit traffeck an preventit air pollution in the residential auries, despite population growthe. Ashdod haed a population o 220,174 in 2015, wi an aurie o 47,242 dunams (47.242 km2; 18.240 sq mi). ↑ "Local Authorities in Israel 2005, Publication #1295 – Municipality Profiles – Ashdod" (PDF) (in Ebreu). Israel Central Bureau of Statistics. Archived (PDF) frae the oreeginal on 29 May 2008. Retrieved April 14, 2008. Wikimedia Commons haes media relatit tae Ashdod. This page wis last eeditit on 1 Mairch 2018, at 00:33.